On to more gifts! I am making a set of cards for dear friends of mine who served in our congregation to help out for a while. They are so lovely and I wanted to thank them for their service as they move on to another congregation. 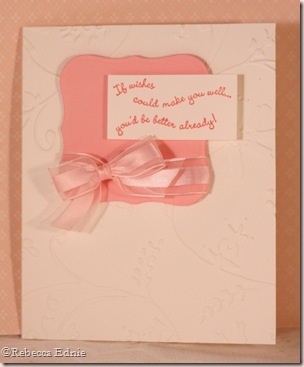 I started with a series of cards using bracket/Labels 1 die cuts from Spellbinders. I am going to show half of them here. A couple are doubles so you will see less than the 8 or so cards I made. I am adding others to the pile and will show them later too. 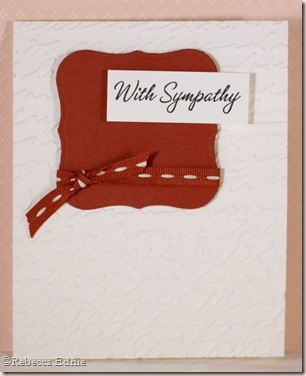 I CASEd this card from someone, I saved the card image but not the link, sorry. It is so hard to photograph mostly white cards so sorry if these come out weird on your computer screen. Paper: cranberry, pretty in pink, white-SU! Previous postAnniversary Card for Hubby-12 Years! And I WON Awesome Blog Candy!